NEW PICTURES ON PAGE 2. 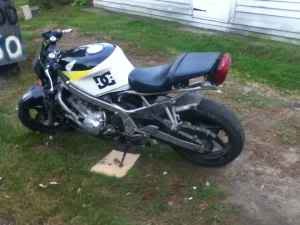 Alright, so I picked this up about a week ago, it is about to be winter here in Maine which means riding is out of the question, and also means that modifications are what I'll be working on this winter. So, here are some basic details on my motorcycle. Purchased on : Sunday, the 27th of November, 2011. Condition : mechanically good, plastics missing (mostly) and a few other damages. Obviously, not the prettiest bike, but that doesn't mean she won't get fixed up nice! 1. Remove gas tank, sand down, repaint. 5. Sand and paint wheels. 6. Purchase new handlebar grips, replace right clip on, throttle and clutch/brake levers and install. 8. Install rear turn signals and mirrors. 9. Replace all fluids, lube chain, general maintenance. 10. Build set of custom fairings. Plus many more I'm sure! I took the tank off last Friday and started to sand it down to bare metal. Hopefully will be able to finish the sanding in one or two more days (depending on how long it takes me to do the concaved parts). Plan right now is to spray it with primer, paint it with black, then I'm going to apply 3 or 4 layers of Plasti-dip and let it cure for a few days. I have a set of gauges that I am going to take apart and mount on a custom front fairing. I'm going to replace the front tire. I ordered a used Yoshi exhaust from a 93 600CBRF2 with 14K miles on it, slipped right onto the bike and it sounds great! Sand down the wheels and paint them according to color scheme. I ordered my throttle tube and grip from my local Honda dealership, installed in a few days later (somewhere around the project start date). I then got a straight clip on and a master cylinder/brake lever and installed them all today. Need to wire them up, but no big deal. Purchase and replace the clutch cable (current one is slightly frayed). Bike currently has no rear turn signals or mirrors, need these for it to be street legal, so I am going to get some mirrors and install them, as well as rear turn signals. 9. Replace all fluids, replace? chain, general maintenance. Going to drain all fluids and refill, install new oil filter, clean and lube chain, oil all cables that should be, POSSIBLY get the carburetors cleaned (bike runs pretty good right now). 10. Build my own set of "stealth bomber" fairings. I am going to start building a set of stealth bomber fairings for the bike. Last edited by That Guy in Maine; 02-06-2012 at 04:22 PM. Well, I just bought a set of used original clip on handlebars off eBay. Should be coming late this week or next week most likely. 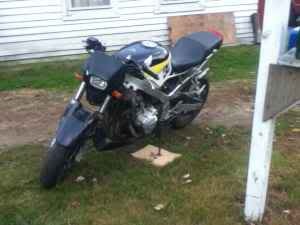 Have to go to the dealership and get a throttle tube and I might just get a grip from them as well just to have it. Going to get a clutch cable too. Should start some work next week at the latest (hopefully). so out of street fighter back to original look. nice. 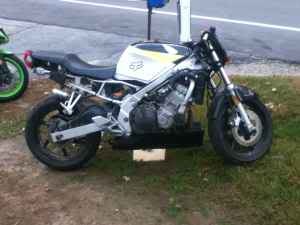 Looks like a fun project, I'm doing the same thing, using winter to bring my bike back to its original glory. So, I think I am going to change my plans. I am going to attempt to make my own "plastics" for the bike out of fiberglass. I know how to make parts and such, and I'm sure I can figure out mounting brackets, it will also give me the look I want. Has anybody tried doing something similar to this? So...finished a few small tasks on the list! 1. I replaced the throttle tube and grip! 2. Wired the rear blinkers, just need to figure out how to mount them now. Plenty more projects to tackle, but it's a good start! "So, I think I am going to change my plans. I am going to attempt to make my own "plastics" for the bike out of fiberglass. I know how to make parts and such, and I'm sure I can figure out mounting brackets, it will also give me the look I want." I just winged it with no experience in fiberglass at all. First piece I tried "tail" is heavy and should be redone but it is going to stay for now. It got cold so I was only able to do one side cover but it went a lot smoother and looks/feels much better. The cost to fab your own adds up pretty quick and takes some time but it does allow you to try and achieve "the look you want". Quick Reply: My 94 CBR600 F2 mod log.